As the temperature rose on another magnificent day in Perth, so did the heat in the Burswood Poker Room with just 50 players still in contention to share in more than $200,000. Players still in contention included Vesko Zmukic, Steve Lackovic, Paul Sharbanee and chip leader Marc Des Anges. The eliminations came thick and fast during the first level, with Luc Monte among the big movers. After some solid play Monte was able to build his stack up to well above average. On a board of J-J-2-Q-J, Monte was able to get all his chips into the middle against Nadeem Jashan who called his all-in bet. Sure enough, Monte held the remaining jack. He would end the day with more than 100,000 in chips. Former Western Classic champion Vesko Zmukic showed that you need some luck to win major titles like this after he put his tournament life at risk against Robert Burns. On a board of 2-3-A, Zmukic put all his chips into the middle and was called by Burns who had A-J. Zmukic showed pocket 5s, and found another 5 on the turn! Zmukic will take more than 130,000 into day 3. There is always one player who seems to have an amazing run of cards in any Main Event and this Western Classic Main Event has been no different. Con Kamaras seemed to be able to fight his way out of any situation. He started the day with only 28,750 and was seated at a table with the likes on Jashan, Zmukic and Parsons. Kamaras made his first move with A-K only to find Maciey Rynkiewicz holding pocket aces. But Kamaras found kings on the flop and river and he was up to more than 70,000. 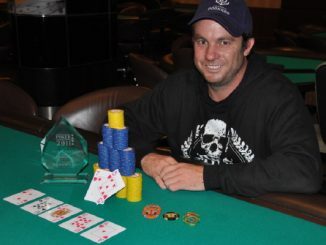 He never looked back, and holds the chip with 167,900 and whole lot of wind in his sails. With just 24 players remaining, it’s sure to be another action packed day in the Burswood Poker Room. • Things might be getting to the serious end of the Western Classic Main Event, just it was the participants in the Ladies Event who showed us how to have fun. Poker Manager Deb Wyatt treated the ladies to a night to remember with no shortage of cocktails and photos before the cards were in the air for the $150 Ladies Event, which featured a 10,000 start bank. The classy field included former winner Charmaine Thorpe, local favourite Lynette Anderson and Trish Dewy, Monday Night PPS V third-place getter Terresa Teale and local poker icon Lyn Brooks. The evening started slowly with more laughs and jokes then card playing, but as the night wore on it was left to Dorothy Bagshaw and Heather D’Orazio to battle it out for the title. D’Orazio was able to dominate Bagshaw in the race to the finish after a good run of cards. She pocketed more than $1600 for her tournament win and promised to be back next year for more laughs and photos.